We, India Reisebuero Pvt. 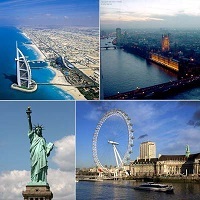 Ltd. located in New Delhi, is engaged in conducting excellent international tours to different countries such has Singapore, Malaysia, Hong Kong & Macau, China, Australia, New Zealand, Europe, USA, Dubai, Mauritius, South Africa and various other places. Besides this, we are offering exhilarating and luxury holiday packages for Singapore. So, if you want to go on a business tour or want to spend your vacation in any part of the world, then you can contact us to avail the best services. We also have special holiday packages and honeymoon packages. Moreover, our dedicated team is there to guide you at every step and will plan your tour according to your budget. So, contact us anytime to book luxury packages for Mauritius, New Zealand, or any other country.